The wasp waist of the Evas in the TV Series does bother me a little... That, along with making the shoulders SLIGHTLY more manageable, is about the only change I impose when I draw mine. The bizarre combination of gracility and power is one of the Evas' trademarks, and I definitely don't think Kyoko-sama had to be robbed of this and reduced to a guy in a suit -- daikaijuu-style -- for the movie. They could have kept her old look mostly intact, while animating her in a more naturalistic manner. Speaking of people who got makeovers for the worse in EoE... anyone notice what happened to poor Kozo? He looks like .....Oh who was it again? Anyway hes got a big chin in EoE. And I think you can see his eyes more. Keisuke-kun wrote: I actually kinda like the EoE look. Her movements seem more realistic than from the series. She looked and moved kinda robot like. I agree. I have to say, I liked the look of Kyoko in EoE as well as the series, mainly due to the slightly more "balanced" look. I despise some of the animation *cough* Guy in a suit *cough* but other than that st00f, it wasn't too bad. I would have preferred if they gave Kyoko-sama a neat, wider chest, so she appeared more like in the series, but [in contrast], I also like what they had done to the waist, making the segments "less visible" I suppose. The gloss I never really liked except during certain segments of the show, so I didn't even noice it was gone, LOL. Strange how Yui kept her series look in the movie, segments and all. Different artist? Well, remember, it was only one animator (well... maybe two) who drew Kyoko with the extra torso segment and made both her and the harpies look INCREDIBLY stupid. She looked... okay the rest of the time, though I still would have preferred if they had left her original design more intact. They also drew one too many segments in this cut , as well, but that seems to be a different animator. Yui-sama actually was changed at least a little; they got rid of the, er, brachial pylons (those thingies on the lower arms) with her, as well. Truth to tell, we really don't see that much of her, close-up and in-your-face like we do with EVA-02, so it's harder to see if there is any decisive sort of alteration. The "added segments" on the waist don't bother me as much as those super-tiny shoulder pylons and the out of proportion eyes/head of Kyoko-sama. I did noice something odd about one of my harpies (the one who got an arm cut off and neck snapped). During the footage I watched, it appeard it's head got really, really swollen looking, being a lot bigge than normal, and then shrank back down when another harpy moved to slam Kyoko-sama, while it's head lolled about. I'll see if I can find some pictars. Here be what I was talking about. ...and then we see this, a horrendously out-of-proportion head. What happened?! Just a bit of an oversight on the animator's part, I suppose. Meh. I still dislike the look...harpies were to have their heads a certain size. Treize X wrote: Meh. I still dislike the look...harpies were to have their heads a certain size. Complaining about the size of the heads (not just the harpy, but Nigouki as well) in that shot is like complaining when Kyoko's hand gets bigger the closer to the camera it gets, until it fills the screen. (You can see this shot in the JSSDF battle.) 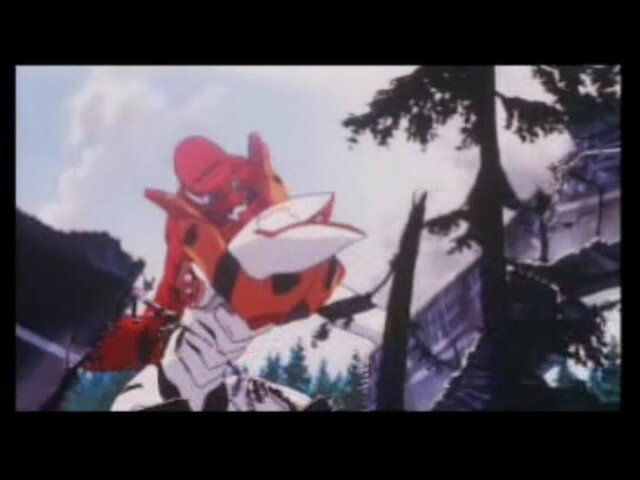 If we're going to complain about anything, it should be how this particular animator draws his Evas. True....you do have a point. Meh. Reichu wrote: Complaining about the size of the heads (not just the harpy, but Nigouki as well) in that shot is like complaining when Kyoko's hand gets bigger the closer to the camera it gets, until it fills the screen. (You can see this shot in the JSSDF battle.) 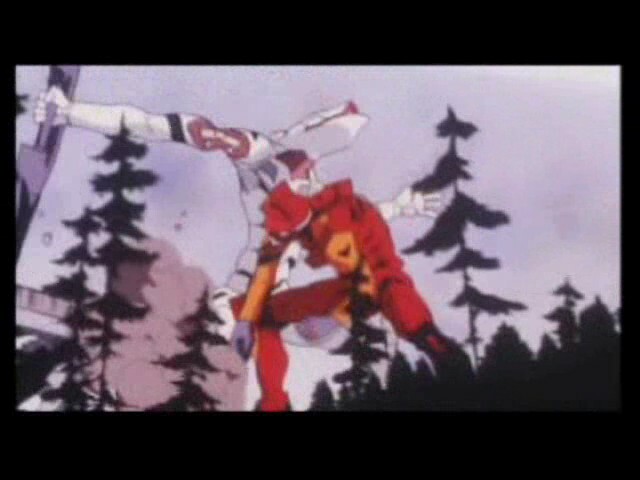 If we're going to complain about anything, it should be how this particular animator draws his Evas. Wow.. I never knew there was so much distaste over Eva-02's redesign for the film. Personally, I like the re-designed Eva a lot more than the original. She's buffer, but still lean and relatively thin. I like the more human-esque physique and think that it fits the Evangelion's "nature". The less extreme shoulder fins make it seem less "anime" and overall it would seem they toned down the more stylistic aspects to the design and made the whole thing more subtle.